This outdoor shamrock gift is a metal wind spinner. This Irish wind spinner features a multi layer green shamrock motif. The metal shamrock wind spinner features a swivel clip that allows it to spin freely; it measures 11" wide x 11" tall x 2" deep. The Irish garden decor is made in the United States and is gift boxed with a shamrock history card, complements of The Irish Gift House. The classic shamrock is a perfect example of understated elegance, with bold color and a fun design everyone can appreciate. 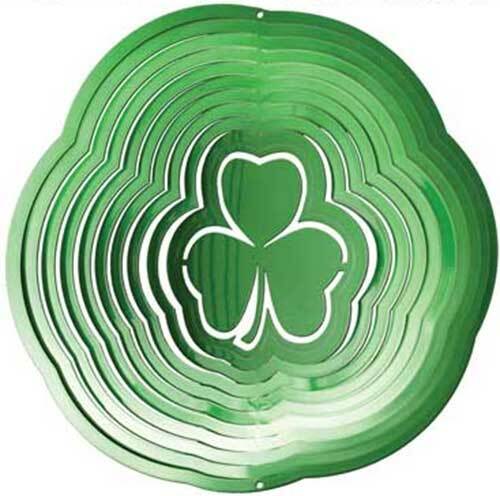 This shamrock wind spinner is crafted from 20 gauge powder coated steel for superior durability and weather resistance.